MSNBC/TwitterSurveillance footage of Mark Anthony Conditt, the Texas bombing suspect. It’s unclear whether investigators viewed this particular clip. Law-enforcement officials have identified the suspect in the Texas bombings as Mark Anthony Conditt, according to multiple news outlets. Conditt, 24, blew himself up on Wednesday morning in a confrontation with police. Officials are said to have tracked Conditt after viewing surveillance footage of him mailing a package. They then investigated his store receipts and online browser history, which showed suspicious activity, according to the Austin American-Statesman. 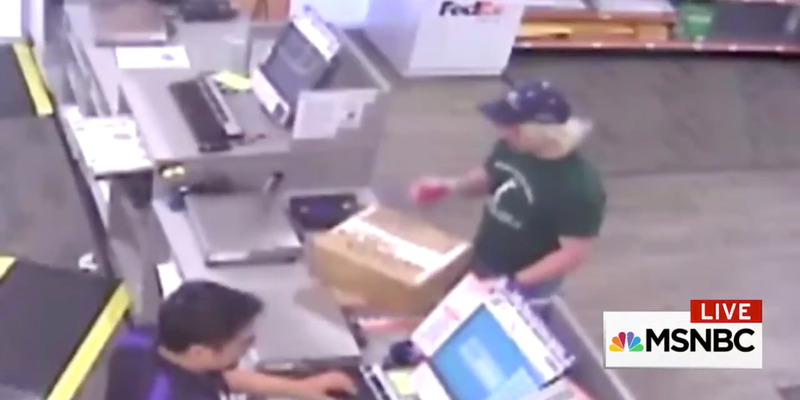 Mark Anthony Conditt, the suspect in the recent wave of parcel and other bombings in Texas that have left two people dead, was found after he was seen on tape shipping a package, according to news reports. Conditt died on Wednesday morning after being pursued by FBI agents and local police officers. Citing law-enforcement officials, NBC News and The Wall Street Journal identified Conditt as the suspect. Authorities have not yet formally identified him, though they described him as a 24-year-old white man. MSNBC/TwitterA second image of surveillance footage showing Conditt. Early Wednesday, police found Conditt in a car. When he noticed them, he detonated an explosive device, killing himself. Authorities had identified several leads in the past few weeks, during which at least six bombs were planted, they said. Authorities identified Conditt as a suspect after viewing surveillance footage of him shipping a package from a FedEx store in Sunset Valley, a suburb southwest of Austin, according to the Austin American-Statesman, which cited a high-ranking law-enforcement official. The report said officials believed at least one package bomb was recently sent from that store. The suspect’s store receipts and online browser history also showed suspicious transactions and searches, the official said.The BBC reported that he had searched for facilities that shipped packages. 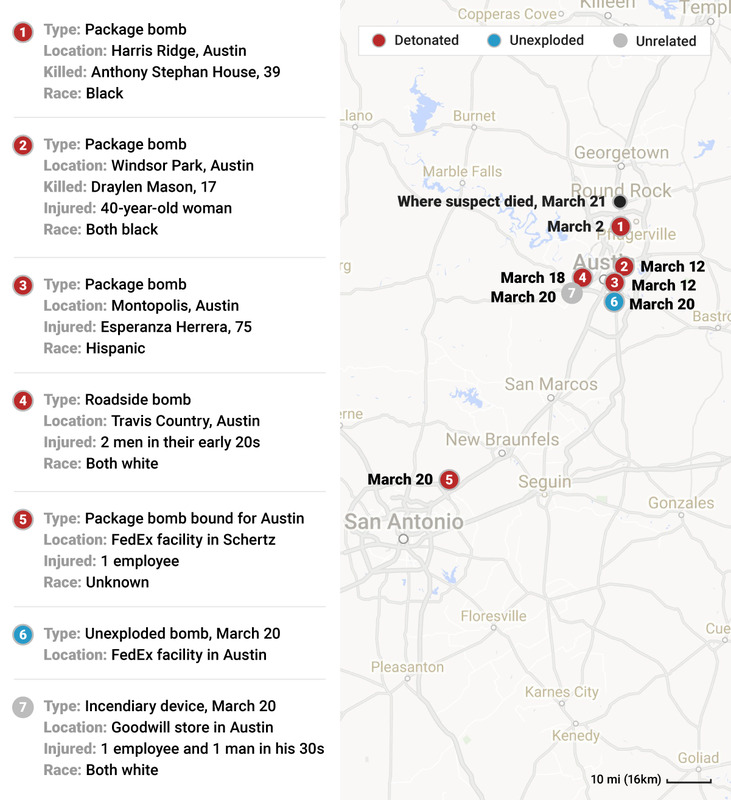 Authorities then used mobile phone data to track Conditt to a hotel in Round Rock, north of Austin, the official told the American-Statesman. That was where they found him and where he killed himself. 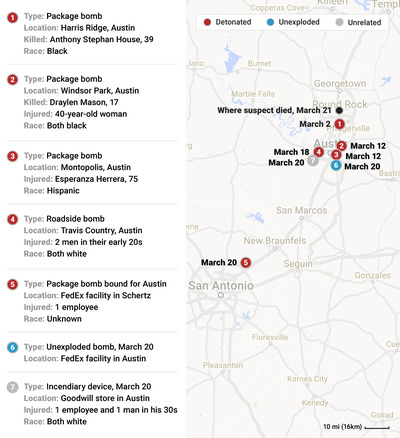 Police believe Conditt is responsible for all the bombings in and around Austin since March 2, which killed two people and injured at least four others. Officers are still trying to figure where Conditt was in the 24 hours before his death and warned that there may still be other devices programmed to explode. Authorities have not publicly identified a motive.